Send them wonderful birthday wishes! 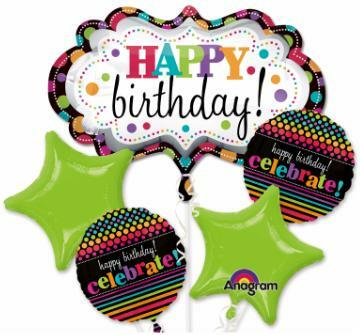 Comes with large supershape Happy Birthday foil, Happy Birthday message foil balloons and solid colour foil balloons to match, attached to a foil weight, $39. Add a large plush bear or gift bag filled with cookies, candies, and chocolates to this bouquet, $59.